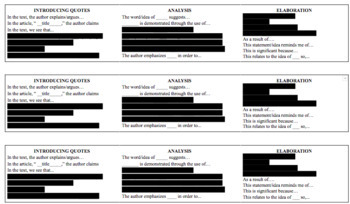 Are you tired of students using the exact same sentence structure in their written assignments? Having trouble getting students to analyze their thoughts? Break up the monotony and improve your students' writing with this easy to implement tool! 20+ sentences frames for students to use when writing. 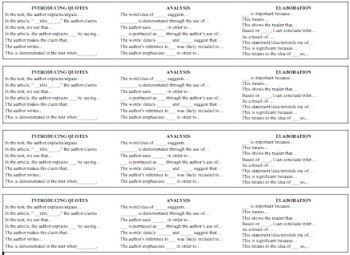 Sentence frames are split into three categories (Analysis, Elaboration and Introducing quotes) and allow students to easily access different styles of writing. Students can use the sentence frames to explain their thoughts more effectively and to deepen their understanding of the content. These will help all students- from Honors to Gen Ed, ELL to SpEd! The sentence frames can be turned into bookmarks, glued into notebooks or taped on desks.